This excerpt says it all. Denial is such a powerful defense mechanism but so detrimental to healing. Denial. I used to live wrapped up in its hypnotically charged blanket, succumbed into thinking I was safe in my little bubble of “happiness”. But recovery requires facing things the acknowledgment and embracing of truths that can be hurtful, painful to recall, enraging, etc. The second half of Chapter 3 from Love is a Choice discusses this exact point. https://tessacandoit.wordpress.com/2015/07/19/the-lovehate-blogger-challenge-accepted-again-get-a-badge-this-time/ I nominated you for a love/hate challenge. Use the link if you want to enter. Yep! I totally get it. Denial is so powerful people waste their lives miserable. Such a waste. 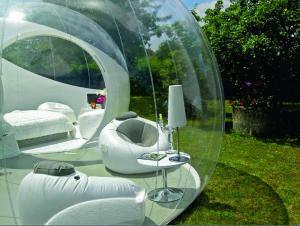 I know it’s not what this article is about, but that bubble house is uber cool!! !